Description This devotional panel depicts the Virgin and Child with St. Joseph and the young John the Baptist, patron saint of Florence. 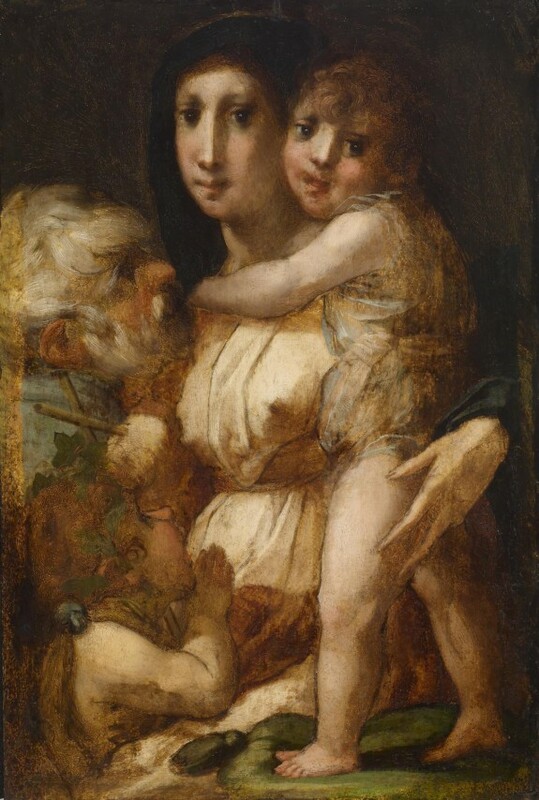 Rosso did not finish the painting, and the underdrawing shows through. Rosso's original and eccentric style is marked by a strange beauty that calls attention to the painter's ingenuity. His figures have large, liquid eyes, "chiseled" shapes, and elongated limbs and fingers. The expressive faces and dynamic brushwork give the painting a high degree of liveliness. Pontormo and Rosso Fiorentino: the different paths of "Mannerism". Palazzo Strozzi, Firenze. 2014. Maniera. Bronzino, Pontormo and the Florence of the Medici. Städelsches Kunstinstitut und Städtische Galerie, Frankfurt am Main. 2016. Unfinished: Thoughts Left Visible. The Met Breuer, New York. 2016. Provenance Don Marcello Massarenti Collection, Rome, prior to 1897 [mode of acquisition unknown] [1897 catalogue: no. 286, as Correggio]; Henry Walters, Baltimore, 1902, by purchase; Walters Art Museum, 1931, by bequest.